The Tax Cuts and Jobs Act, which was signed by President Trump on December 22, 2017, is a momentous tax package that includes many permanent and temporary tax law changes most of which will not apply until your 2018 tax year. 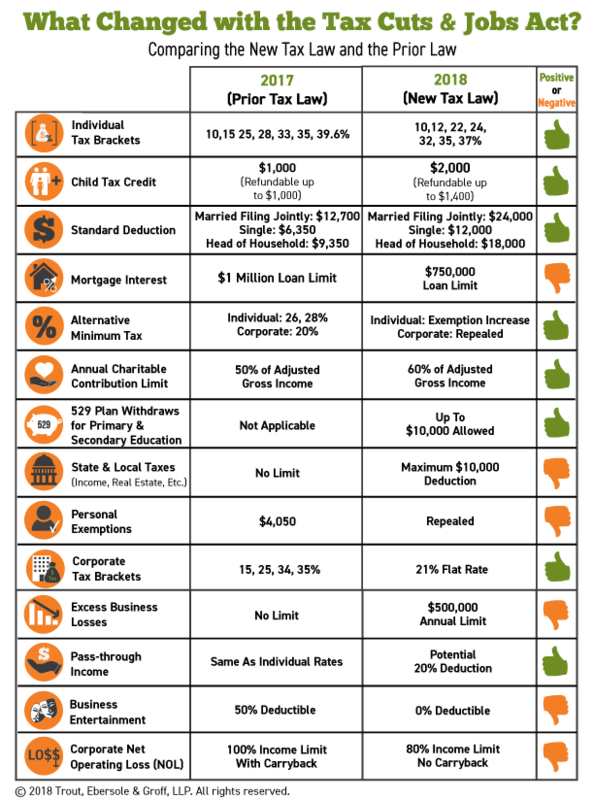 Below is a comparison of the new tax law and the prior one. Individuals continue to have a 7-bracket structure that is graduated; however, 5 out of the 7 brackets are at a lower percentage. The C-Corporation taxation will be a ﬂat 21%. For most, it will mean a tax reduction. Not only are the rates lower, but for individuals, the brackets were mostly expanded (with the exception of single & head of household ﬁlers which were adjusted to eliminate the “marriage penalty” in all brackets except the highest one). For example, the top tax bracket does not start until income exceeds $600,000 whereas for 2017 the top bracket started at $470,700. Click the link below to download a pdf verison. © 2019 Trout, Ebersole & Groff, LLP. All Rights Reserved. Trout, Ebersole & Groff and TEG are trademarks of Trout, Ebersole & Groff, LLP.